The Lijnbaan, built in 1953 and designed by the architeture firm Van den Broek en Bakema is now a national monument. The combined mix of living, working and shopping symbolizes the era of reconstruction after world war II and leaded to an open and transparent urban ensemble. The concept for the mall Lijnbaan was unique. It had a human scale and gave priority to the pedestrian. The light canopies divide the longitudinal space into small spatial segments, provided with frivolous flowerbeds and terraces. Even today the popularity of the Lijnbaan is still high. The Lijnbaan is the heart of the urban ensemble and has been redesigned. The redesign includes new granite paving strips, green planting areas and generously sized new seating objects. The leading design plan was made by Atelier Quadrat and seeks links between urban design, architecture and outdoor space. The tile sizes are inspired by the original grid dimensions, measuring 1.10 x 2.00 meters. The other design elements such as seating objects, hedges and gutters do all fit in this measurement system. 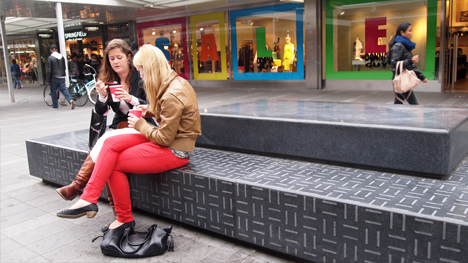 The granite seating objects, designed by Blom & Moors, are placed on the longitudinal axis of the Lijnbaan. Due to their dimensions they form striking little islands in the stream of shoppers. Halfway through the shopping street two of these objects are placed together. This is the favorite spot for chatting, resting or eating ice cream. All seating objects are slightly different by the use of five different decorative patterns, subtly engraved in the dark surface. Color, pattern, size and position of the seating objects enhance the clear principles behind the Lijnbaan concept. This way the desired image of the Lijnbaan as a recognizable and coherent unity is restored.